7.5" Overall with a sharpened 3.5" double edged blade. The Cold Steel True Flight Thrower beats the competition by a wide margin. 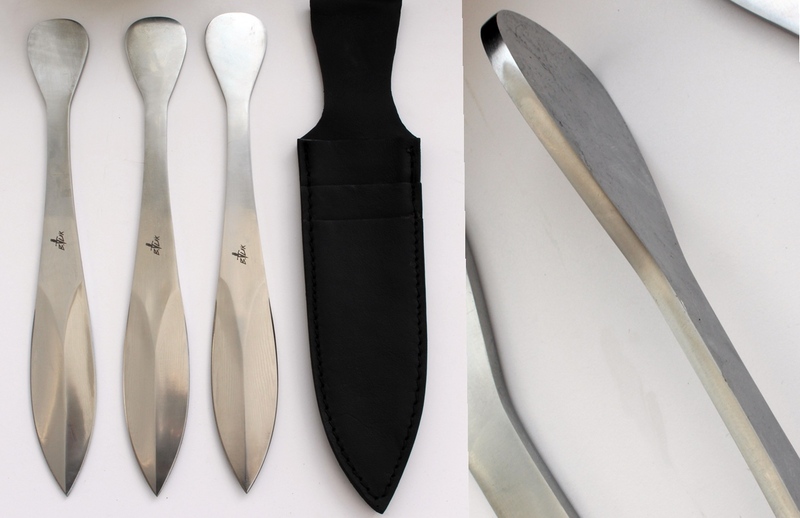 For strength, we use 1055 carbon steel and finish it with a black, baked-on protective coat. 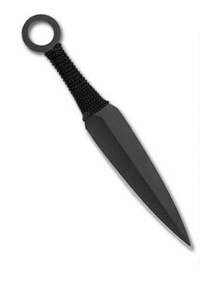 This makes for a hard, yet resilient blade that will "bounce-back" from any throw. And for versatility, the True Flight Thrower has a utility edge that will stand-up to your toughest chores. 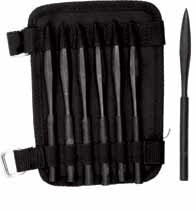 The Shuriken (needles) of the Ninja included various missiles such as dirks, darts and star-shaped discs, all forming part of the art of shurikenjutsu, which was an important part of the Ninja's armoury. 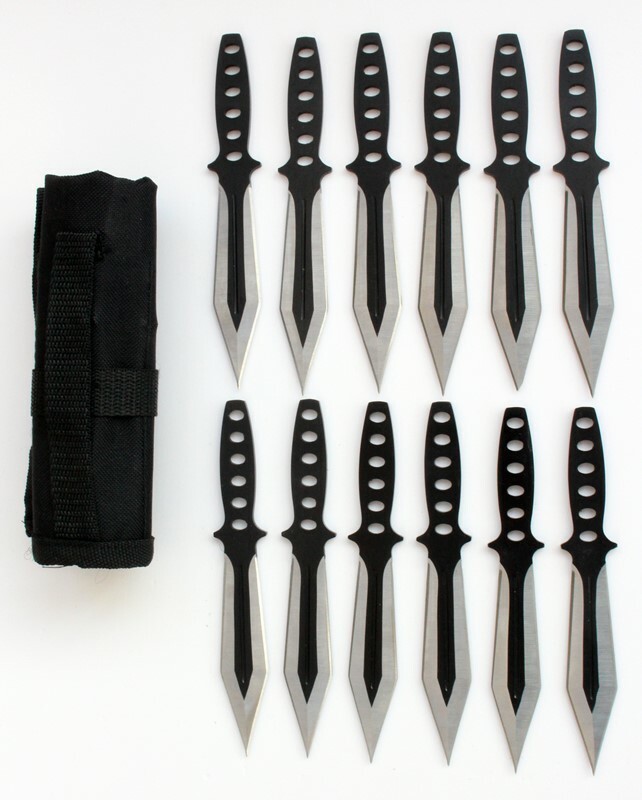 The Shuriken Set contains three forged and tempered darts in a canvas forearm band and the darts are black plated in the Ninja tradition. 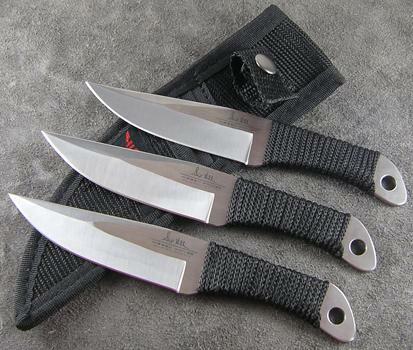 WEIGHT: 2 1/2 oz -- 60 g.
Each knife measurs 6.5" Overall with a 4.2" sharpened, double edged blade with green cord wrapped handle. 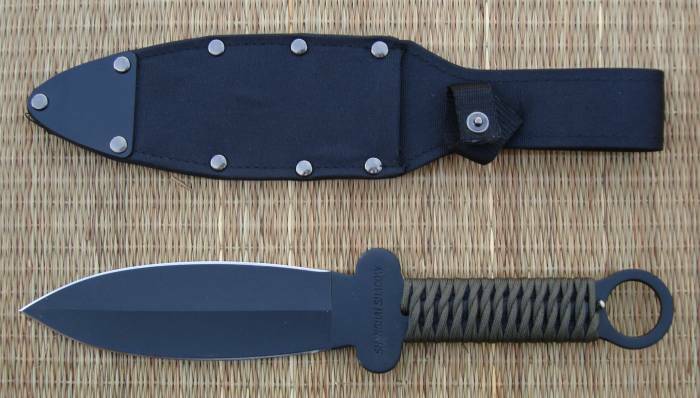 Nylon leg sheath included. 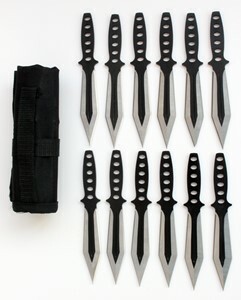 A set of 12 throwing knives with nylon belt sheath, Each knife is 6" Overall with a 3.5" sharpened, stainless blade with two tone finish. 12" Overall with 5" sharpened, polished, tempered, D2 carbon steel blades. Complete with high grade leather sheath, top spec steel chosen for its high hardness, durability and added silicon for shock absorbing flexibility. Features a 7.00 in. black blade of 1055 carbon steel, and a 6.25 in. black Paracord wrapped handle. 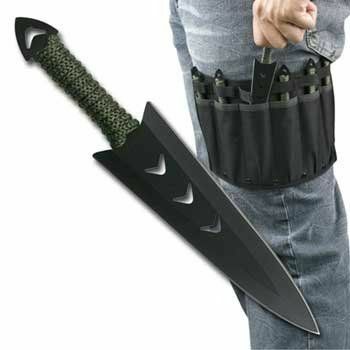 Comes complete with a Cordura sheath.